A young couple enjoy their first intimate moments together in the feature debut from London-born filmmaker Len Collin, an Irish comedy drama whose simple premise belies its quiet power. 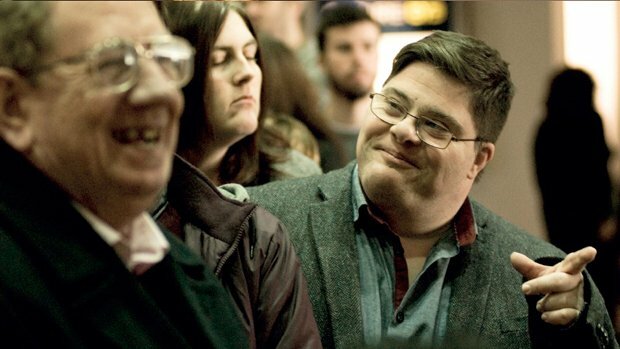 Adapted from the hit stage play from Galway-based Blue Teapot Theatre Company, a programme for people with intellectual disabilities, it is a film about the challenges of disability whose characters refuse to be defined by their conditions. The cast of the play remain in place, with the charming pair of Kieran Coppinger and Charlene Kelly reprising the lead roles of Larry and Sophie, around whose burgeoning romance the story revolves. When their social group heads out on a trip to the cinema, they take the chance to slip off to a nearby hotel to spend some rare time together. Such subterfuge is essential as, given that Larry has Down's syndrome and Sophie suffers from epilepsy and constant tremors, they are forbidden – by society and by Irish law – from having an intimate relationship. Yet the screenplay, from original playwright Christian O'Reilly, avoids any obvious soapboxing, allowing the realities of the situation to emerge through the experiences of its characters, who are brought to life in naturalistic performances. As the narrative veers from situational comedy to heartfelt emotion – Larry and Sophie's discussion about how their lives might look if they were 'normal' is moving without being mawkish – it effectively shines a soul-searching light on how so many people are denied things that most of us take for granted. And if some moments are a little rough around the edges, that's in keeping with the film's insightful exploration of the difficult realities of life for those who don't conform to widely accepted norms, and its celebration of the power of human connection – whomever we may be. Limited release from Fri 29 Dec.
Love story between Larry (Coppinger), who has Down syndrome, and Sophie (Kelly) who has severe epilepsy. The screenplay avoids obvious soapboxing and shines a soul-searching light on how many people are denied things that the rest of us take for granted.